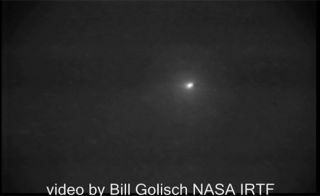 This photo, a still taken from a NASA telescope video, shows Asteroid 2010 TD54 as it passes Earth on Oct. 12, 2010. It made its closest approach to Earth at 6:51 a.m. EDT (3:51 a.m. PDT). Full story. A small asteroid passed closeby Earth today (Oct. 12), flying within the orbit of the moon while astronomerswatched to see if the encounter caused any quakes on the space rock. Astronomers at the MassachusettsInstitute of Technology in Boston used a remote link with a NASA InfraredTelescope Facility in Hawaii to observethe small asteroid, which was up to 33 feet (10 meters) across. There was no risk of theasteroid enteringEarth's atmosphere or exploding, and it was too small to survive the fieryentry even if it did. But that did not keep astronomers from taking a closelook as the space rock sailed by. "For 2010 TD54, we wantto learn its basic composition and to watch whether its close encounter withthe Earth causes any changes," astronomer Richard Binzel, a professor ofplanetary science at MIT, told SPACE.com. Past studies have shown thatclose encounters with Earth can cause quakeson nearby asteroids that move surface material around, altering spacerocks' appearances. Asteroid 2010 TD54 wasdiscovered Oct. 9 by astronomers with the NASA-sponsored Catalina Sky Survey inTucson, Ariz.
Small asteroids that arepreviously unknown, like 2010 TD54, often pass by Earth. An asteroid about 16.5 feet(5 meters) across can be expected to pass Earth inside the orbit of the moonabout once a day, NASA scientists said. They typically enter Earth's atmosphereonce every two years or so, they added. There are an estimated 30 millionunknown asteroids in our solar system. Bigger asteroids about 460feet (140 meters) wide can cause widespread damage around their impact sites,but for global devastation much larger space rocks would have to strike Earth. Binzel said he and hiscolleagues study asteroids by observing them in visible and near-infraredwavelengths of light, which allows them to determine which minerals arepresent. "The presence andstrength of mineral absorption bands over these wavelengths allow us tointerpret their compositions ? and directly relate these compositions to knownmeteorite samples, whenever possible," he said. NASA regularly tracksasteroids and comets that fly near Earth as part of its Near-Earth ObjectObservations program, which uses a network of ground and space telescopes. Theprogram has tracked 85 percent of the largest asteroids that fly near Earth and15 percent of asteroids in the 460-foot class, according to the latest report. NASA also plans to sendastronauts to an asteroid by 2025 under new space plan ordered by PresidentObama. The mission could help scientists better understand the composition ofasteroids, as well as develop better methods of deflecting them before theypose a threat to Earth, space agency officials have said.